Our work is for all ages, abilities and backgrounds, and often transcends language. 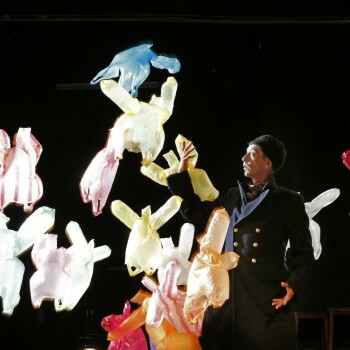 Audiences at our shows have played instruments made from light, climbed through walls formed by hundreds of fine elastic strands, and been showered with 1.5 tonnes of white feathers. 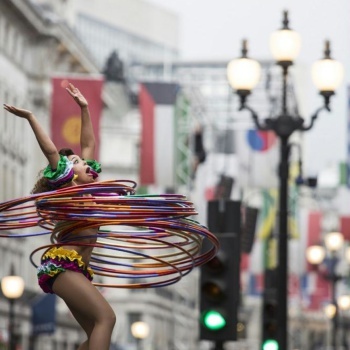 Through the project Circus Evolution we worked with ten regional UK venues to bring contemporary circus shows to new audiences. Through our Opening Out programme we develop bespoke performances and creative residencies for children on the autistic spectrum. Over the years, Crying Out Loud has also delivered a programme of residencies aimed at promoting cultural exchange and providing training and dynamic new experiences for artists. Your support can make an artist’s ideas become reality. We work with extraordinary artists to help bring their work to life and to enable audiences to be inspired by it. Help us take circus nationwide and give audiences outside the capital an opportunity to see more quality work. 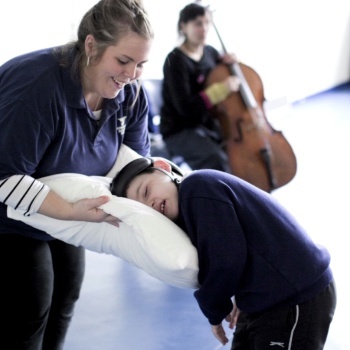 We develop and deliver bespoke performances and creative residencies for children on the autistic spectrum. Help ensure that these children have an opportunity to creatively interact with artists to encourage them to find new ways to connect to the world around them. For every £1 we receive, we spend 86p on our projects, 11p on admin and the remaining 3p to raise more money. You can help us make magical, memorable, and moving experiences. From supporting a show touring to audiences near and far, to helping the creation of a new performance, or allowing us to develop bespoke programmes for children with autism, your support goes a long way.